"Okay, ready to dive?" Diving master Mick Harris grins as I take a few deep breaths in anticipation, gentle waves lapping at my chin. On the count of three then,” he relays. Kicking heartily, we duck dive, and are propelled metres downward into a blue-green world. Almost instantly Mick squeezes my hand, pointing excitedly as three young grey nurse sharks swim up towards us. I reach my hand out, almost grazing the gentle creatures as they glide by untroubled. The sharks are juveniles, Mick explained earlier that day, as we fitted out flippers and wetsuits in his local shop, Shellharbour Scuba Centre. Now, face-to-face with the metre-long swimmers, their knowing eyes peer curiously at us before meandering on, unperturbed. I hold the air in my lungs, wishing to stay in their calm presence as long as possible. Finally I squeeze Mick’s hand, and we ascend towards the filtered daylight above. Breaking the surface, I take in the fresh air before absorbing my surreal surroundings. We are at the centre of Bushrangers Bay with dozens of young sharks circling below. We’ve ambled through heritage listed coastal rainforest to reach this secluded cove. A couple more dives and it’s time to head in. We pass schools of colourful fish and a few curious sting rays on the swim to the rocky shore. As late afternoon sets in, we jump back in the car with Biserka, our guide from Tourism Shellharbour, and head west to leafy Albion Park. A little knackered from the snorkelling adventure, we arrive at dusk outside an elegant 19th century building. Built in 1893 as a grand Georgian-style manor, the McCallum family took over the property in 2000 and have completely transformed it. Set upon three acres of heritage gardens the brilliantly restored Ravensthorpe resembles a French chateau, and today it plays host to swish high teas and wedding celebrations. We are greeted by owner Hamish McCallum, who tells me I’m in luck – my lodgings for the night will be the bridal cottage, which is a short walk from the main house. Once settled into my beautiful cottage, Hamish kindly invites me to return to the main house to explore a little before dinner. Rejuvenated, I amble over and see that the manor is now splendidly lit from floor to ceiling. Wine in hand (a red chosen for me by Hamish) I wander through more elegant rooms, each high-ceilinged, ornate and filled with antiques. Long tables are set for tomorrow’s high tea decorate one room, a wedding ballroom fills another. In our private dining room, we are politely asked about our dietary requirements, and then the night is in the hands of the chef – Hamish’s mother Deborah, who trained at French gastronomy school, Le Cordon Bleu. What follows can only be described as a gourmet feast. A smorgasbord of colourful, inventive and flavourful dishes – sweet figs, pumpkin-filled zucchini flowers, slow roasted fennel, prawns, fish pie. More than 10 individual courses are followed by extravagant desserts. At the end of the night, I make my way back through quiet grounds to the pretty cottage. In the morning, I bound outside to get a good look around the manor gardens in the early morning light. After a beautiful breakfast of fresh fruit, yoghurts, muesli, pastries, warm rolls and café-style coffee, we hit the road for the next adventure. We wind our way further inland through sprawling green countryside. Macquarie Pass National Park is the destination in mind and as we get closer the road begins a steep descent before plunging into dense forest. Pulling over by an inconspicuous track entrance, we jump out to meet our exuberant walking guide Paul Dickson. Driven by his passion for nature and ecology, Paul runs Nature Engagement Tours, leading guided treks and day tours throughout 10 national parks between Aspen and Narooma. Today we’re in store for Paul’s new Scones in the Forest Tour – an exceptional wander through fern-filled forest, followed by jam and scones, handmade by Paul’s mum. As we take to the trail, with leafy gorges and towering gums on either side, Paul shares his knowledge, pointing out scratched-up earth where lyrebirds have foraged for food and 300-year-old trees with hollow limbs where owls and possums may make a home. At the end of the track we sit down to enjoy the scones, Paul revealing the variety of jam he’s brought along and explaining his mum’s scone-making process. With all devoured and well wishes sent to their maker, it’s all too soon that we’re back on the road, returning through the dense forest and out onto the rolling hills. As our car speeds away from these enchanting forests, I find I’m already planning my return hike, and have decided to take Mick up on an introductory scuba dive course, back in the underwater world of grey nurse sharks. 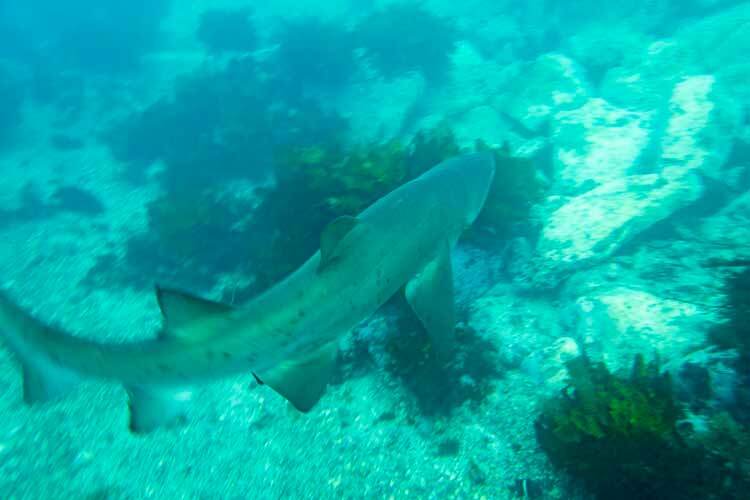 · Grey nurse sharks are listed as critically endangered on the east coast of Australia, with an estimated population of less than 300 along New South Wales. · Macquarie Pass is one of Australia’s southern-most areas of subtropical rainforest.